Do you frequently need to make a lot of waffles at once? Do you also like appliances that are small and easy to store away when you’re not using them? Well then the Hamilton Beach 4 Piece Belgian Waffle Maker might be exactly what you need. The Hamilton Beach 4 Piece Belgian Waffle Maker is a nice tiny machine that packs a big punch. As the name indicates, this little waffle maker cooks four full sized Belgian waffles at once. Pretty impressive for a waffle maker that is only 12.5 x 15 inches wide and only 5.5 inches thick. That is another great feature of this waffle maker- it is super thin and compact so you can easily store it upright in your cabinet when you aren’t using it. While it may be tiny, it is quite a heavy machine which speaks to its good construction, no flimsy waffle makers here! The non stick plates also make for easy kitchen clean up (or no clean up at all) while also creating deep pocketed Belgian Waffles. The Hamilton Beach 4 Slice does have an indicator light to tell you when the machine is hot but that is about it for any fancy extra features. No drip tray, no temperature controls, no timers- just straight forward Belgian waffles. But do you really need any more frills? Averaging about $30, this waffle maker seems like a fantastic option to make a lot of Belgian waffles at once! So let’s see how the waffles really come out! Watch our video review or keep on reading! The Hamilton Beach 4 Piece Waffle Maker took about 5 minutes to heat up (at least that is when the nice green light came on telling me the waffle maker was ready for batter!). I needed a lot of batter to fill up all four deep Belgian waffle squares and ended up using about 2 1/2 cups of amazing waffle batter– those are some big waffles! While there is no light to tell me when the waffles are fully cooked, the instruction manual recommended 4-5 minutes to cook the waffles. Being impatient, I checked them after three minutes and was surprised to see that they were already pretty golden brown! That was fast! Time to take them out and see if they pass the Belgian Waffle crunch test. The waffles came out of the machine really easily- the non stick coating worked wonders! When I cut into the Belgian waffles, they were super crunchy. While I like a good crunch to my Belgian waffle (which are suppose to be crunchy on the outside and fluffy on the inside), I may recommend cooking them for only 2-3 minutes next time. But hey, that means you will have your waffles even sooner right?!? Is This The Waffle Maker For Me? Yes! 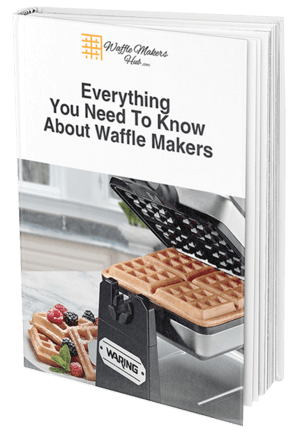 If you need to make a lot of Belgian waffles at once, then I would highly recommend this waffle maker (if you are looking for a smaller, single waffle machine, check out our Ultimate Buying Guide with even more reviews!). Not only did it cook quickly but the waffles were evenly browned and tasted amazing (I’ll be cooking up some sweet potato waffles next on this machine!). I didn’t have to clean the machine at all but just closed it and slid it right into a tiny spot in my cabinet. Waffles for a crowd will no longer be a problem with the Hamilton Beach 4 Piece Waffle Maker so check out the current price here and order one today. So many delicious, golden Belgian waffles in your future!